Kids and families celebrate Scratch, the programming language and online community, on its 10th anniversary. 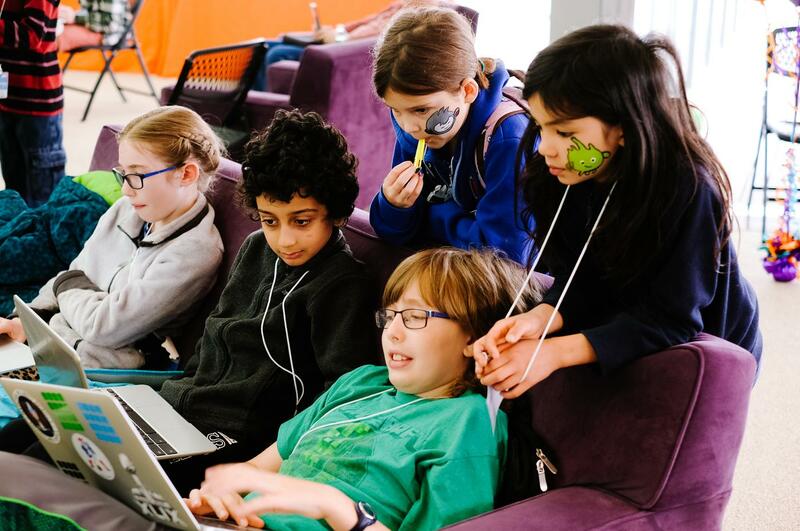 Many of the children taking part in Scratch Day 2017 at the MIT Media Lab on May 6 were not even born when the programming language was released in 2007. 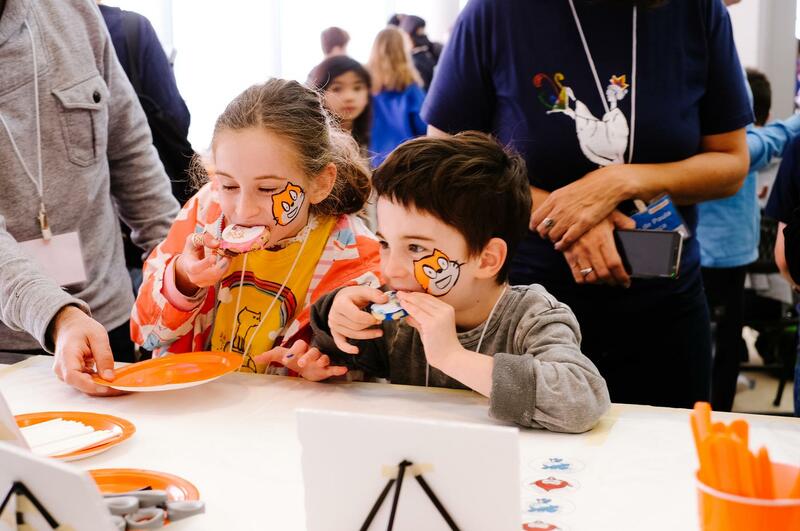 Each year in May, children, parents, and educators gather at Scratch Day events to meet in person and to celebrate Scratch and ScratchJr (a simplified version for kids 5-7, released in 2014). This month, on the 10th anniversary of Scratch, there have been over 1,110 Scratch Day events in about 70 countries. The May 6 event at the Media Lab drew 300 children, parents, and teachers from across the Boston area and beyond. When tickets were made available online last month, they sold out in just three hours. “Jocelyn is essentially an ‘artsy’ kid,” said her father Don Marencik. “But Scratch has helped her use her analytical side to learn computer science as a way to express her creative side.” Another benefit, Marencik said, is that gender, race, and other “labels” have no place in Scratch: “Everybody’s equal.” Jocelyn also runs Scratch camps, and last year she set up Got Tec Richmond to provide technology equipment to underserved students and teachers in the Richmond area. Walter, a 9-year-old from Seattle, WA, was particularly interested in the Share & Tell activity, where kids presented their projects and took feedback from the audience. Walter chose the username wers90 when he started on Scratch last September. “It’s just really fun. I do some animations but most of the time I love to create games. If I end up doing other things with coding when I get older, Scratch will probably still be my fun time.” He began to teach it to his 4-year-old sister Andrea last month, and she’s already created an animation with music she recorded. Their mother Jenn Lin, who works in coding, has also become involved, and together all three made a musical animation they called The Scratch Band project. Eight-year-old Gabriel, from nearby Belmont, goes by the username eyeball. As he experimented with the light play activity at Scratch Day, he explained how he was creating shadows and programming the lights to change color because “I’m the boss of it. 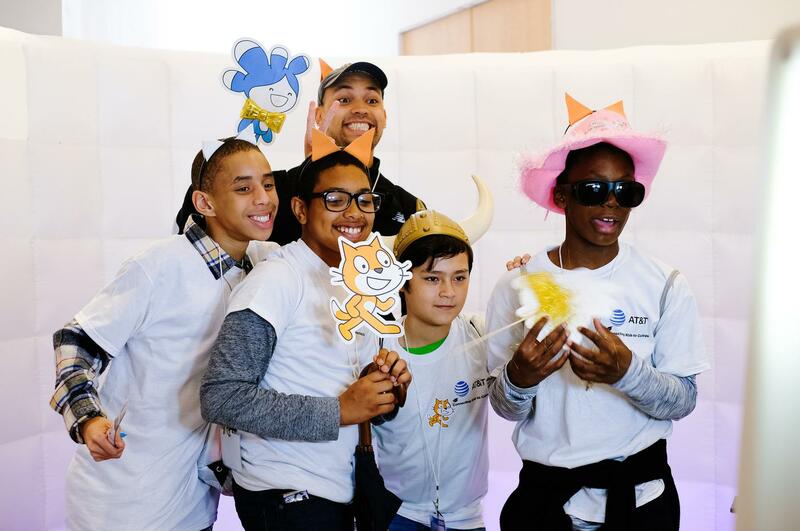 You can do so much with Scratch.” His 7-year-old friend Cameron, aka kingcamster on Scratch, said his favorite thing is “when I come up with my own ideas to make up my own games.” Cameron and Gabriel said they enjoy being part of Scratch’s online community. Other children pointed out that mastering Scratch has helped them across all their school studies, in that it’s given them more confidence to dive into new subjects and ideas and to learn by doing and collaborating. 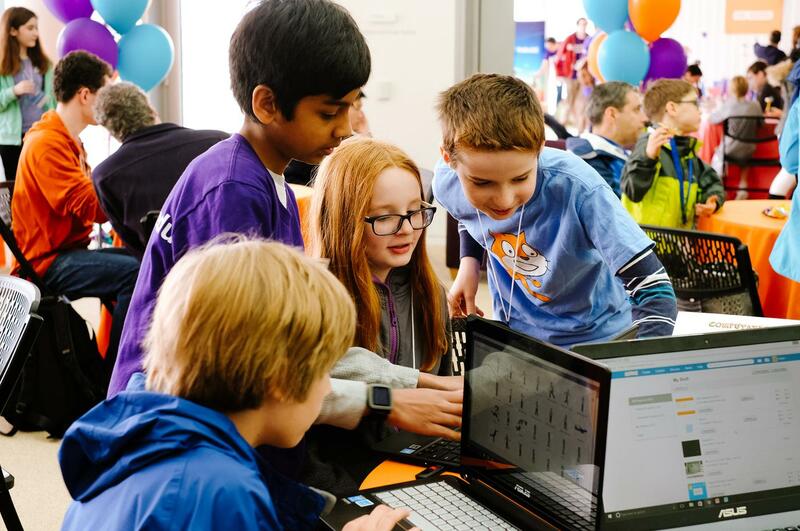 As children create and share Scratch projects, they’re learning to think creatively, reason systematically, and work collaboratively—essential skills for everyone in today’s society. (l-r) Scratcher Jocelyn with Scratch co-creator Mitchel Resnick who heads the Lifelong Kindergarten group at the MIT Media Lab, home base of the Scratch team. Scratch is a free programming tool for children aged 8-16 to create animations, games, music, and interactive stories. It’s also an online community where children can share their projects and collaborate with one another. Over the past decade, more than 18 million people have joined the Scratch online community, from every country in the world except on the continent of Antarctica. Scratchers have shared more than 22 million projects, with 30,000 new ones every day. Throughout Scratch Day at the Media Lab, children from the Boston area and farther afield collaborated on projects. Among 15 different hands-on activities, Scratchers designed, printed, and ate their own "computational cookies." That philosophy of learning-by-making was evident at Scratch Day, where children (and adults) could try out any or all of 15 different hands-on activities. Among them: designing and printing edible computational cookies, exploring light patterns with Scratch, playing with a PBS KIDS version of ScratchJr, and creating musical monsters. Throughout the event, a big screen showed video cards that Scratchers created on the spot to celebrate Scratch’s 10th birthday. Teacher Alberto Aquino (in back) brought a group of 22 Scratchers from the Armory College Prep program in Washington Heights, New York. 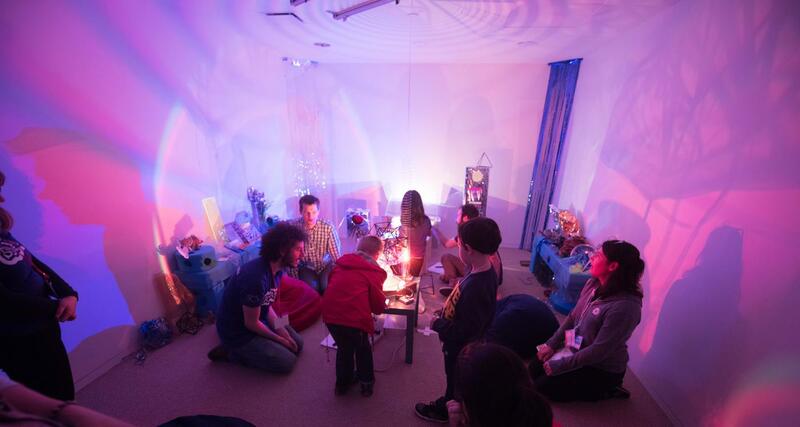 In the Light Play activity, kids used Scratch to explore and manipulate light patterns. 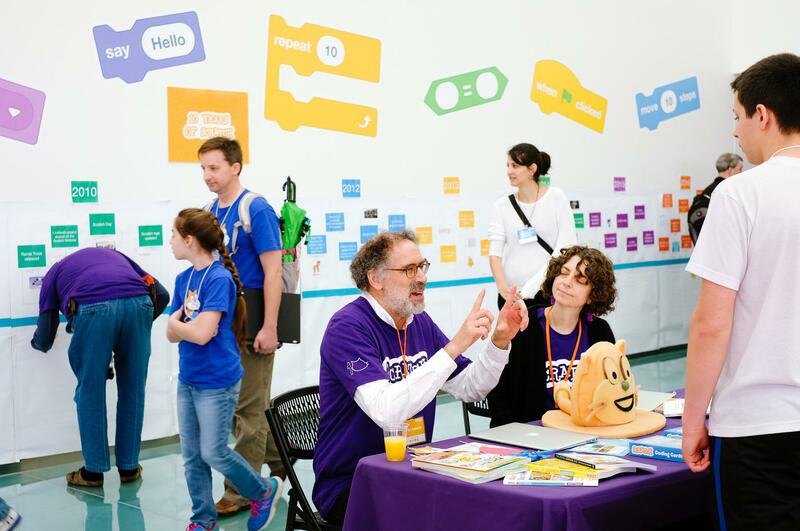 There are 20 people working with Resnick and Rusk on the Scratch team, which is based at the Media Lab. Their work is backed by a range of companies, foundations, and individual donors. The Scratch Foundation, established in 2014, supports fundraising and dissemination of Scratch. 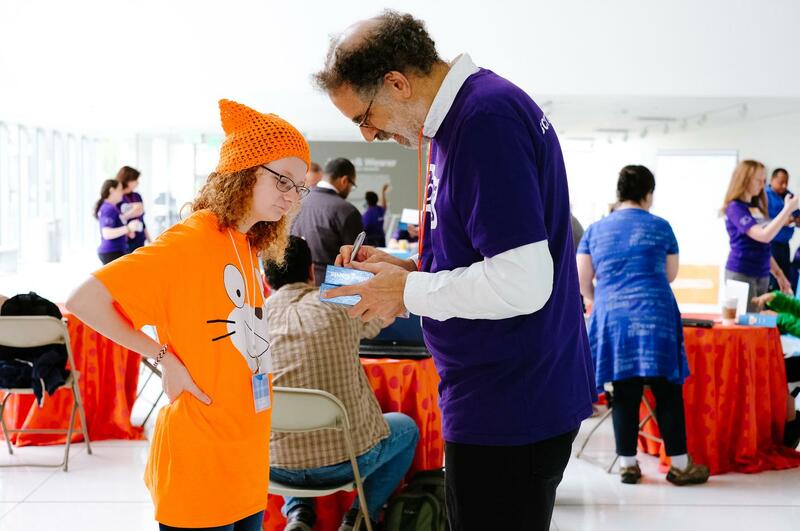 (l-r) Scratch co-creators Mitchel Resnick and Natalie Rusk chatted with Scratchers who had a lot of ideas for the future of Scratch. Scratch 3.0 will also connect users with their external world—using Scratch as a universal platform for coding things in their lives, such as a LEGO construction kit, a music streaming service, a DIY project, or any physical item they use. Many Scratchers who followed each other and collaborated in the program's online community said they enjoyed meeting fellow Scratchers in person.